I just attended a seminar on network theory. The speaker presented some interesting results on the reconstruction of communities in static or temporal networks. The talk was clear and the results well presented, but the thing that impressed me more were the references. The results, he had shown, were produced from 2012 to 2015 and published in 5 different papers (1 PRE, 1 PRL, 2 PRX, and 1 ArXiv). He was the only author of each one of these papers. Nowadays this is very unusual. 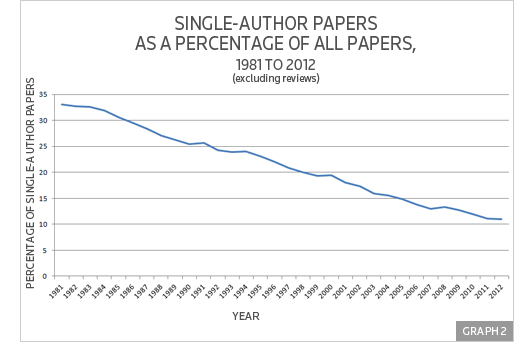 In fact the number of papers with a single author is decreasing year by year, see for instance the plot below. I always had a great respect for people that publish papers alone. They have a nice idea and they are able to ca rried it on until the paper is out, without the need of external support. 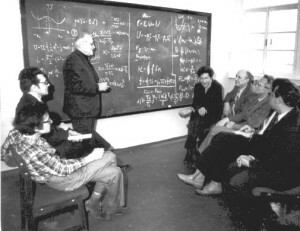 This is in contract with the normal behaviour I found in my field (and probably also in others) where in some paper there is a large number of authors, sometime up to ten. When I think that the Fermat theorem or the Poincaré conjeture were demonstrated by single author I found this behaviour ridiculous. I understand that when it is a matter of an experimental paper where there is someone that prepares the sample, some other that makes measurements and so on.. you can have many authors but in theory it is not the case. So when I see theoretical papers with more than three authors the first thing I do it is no to cite them when it is possible. 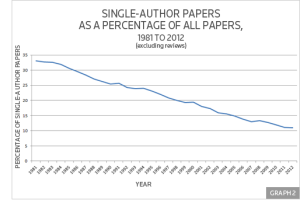 Other interesting articles on single author papers. The speaker was Tiago P. Peixoto.